"Carrie is in a stable condition. If there is a change, we will share it. For all her fans & friends. I thank you for your prayers & good wishes." The 60 year old Carrie Fisher suffered cardiac arrest mid-flight while returning to Los Angeles from England, where she was on a book tour for her latest biography The Princess Diarist. On late Friday, the actress' brother Todd Fisher relayed the information that his sister was on a ventilator in an intensive care unit. It is believed that Fisher's health greatly improved over the three day weekend. The UCLA Medical Center where Fisher is still currently staying have not offered a public update. 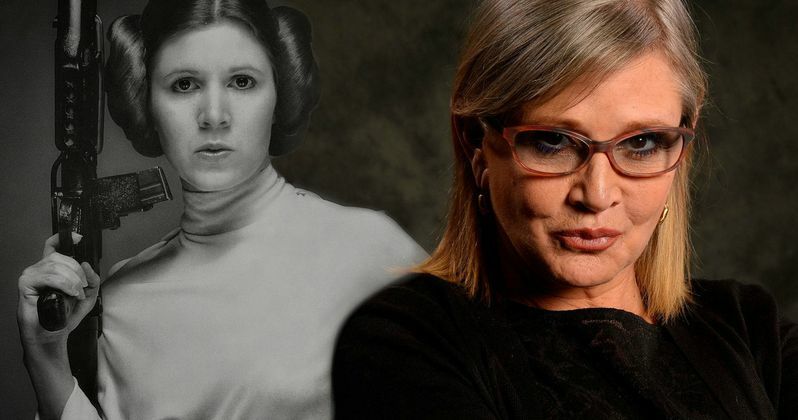 While she has plenty of iconic and cult favorite movies under her belt, like The Blues Brothers and The Burbs, Carrie Fisher is without a doubt best known for playing Princess Leia in the first 7 live-action Star Wars movies. The space saga catapulted her to worldwide stardom, and with the recent return of the franchise courtesy of Disney, she and her character have been more popular than ever. Over the Holiday weekend, co-star Mark Hamill celebrated his on-screen 'twin sister' sharing photos of the two with the hashtag #CarrieChristmas. He posted this message for the world to see, which many felt was sweet and fun. "Dear Santa -- all I want for X-mas is for the Force to be strong with this one." Harrison Ford responded to the news on Saturday, Christmas Eve, saying he was 'shocked and saddened' to hear the news about his 'dear friend'. Other members of the Star Wars family have also responded in kind to send Fisher well wishes over the Christmas break. Fisher had just finished filming the third season of her latest project, the Amazon Comedy TV series Catastrophe, set in London, while also going to various book stores and other UK locations to promote her book. She most recently made headlines when she divulged the fact that her and Harrison Ford, aka Han Solo, had a brief but intense love affair way back in 1976 on the set of the original Star Wars. It was a much talked about topic of discussion as Fisher launched her book tour. Carrie Fisher will next be seen on the big screen in Star Wars 8 when it hits theaters this time next year, returning once again to reprise her role as General Leia.